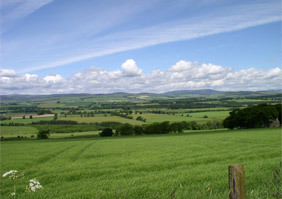 Littlewood Land Care has been contracted by Scottish Natural Heritage to deliver a series of awareness-raising events and advisory visits for farmers in the lower part of the South Esk catchment. Like many of Scotland's rivers the South Esk has been affected by diffuse pollution - a series of very small pollution sources which individually might be quite insignificant, but which cause problems when combined across larger areas. Diffuse pollution can affect water quality and so alter the mix of species found within a burn. It can have negative impacts on species which are protected under European law, such as salmon and freshwater pearl mussels. These catchments have been chosen because they have particularly important sites and species within them - the South Esk contains important salmon and freshwater pearl mussel populations and the Montrose Basin whilst in the Savoch Burn there is the Loch of Strathbeg. Within these catchments, Littlewood Landcare, in partnership with Walking-the-Talk from Tarves, have been contracted to deliver events and advisory visits for local farmers. If you'd like to attend this event, or if you'd like to find out more about the project, please contact us.